In Japan, we have a custom to eat a feast called “Osechi” to celebrate the New Year during the beginning of the Year, January 1st to 3rd. Osechi mainly consists of some foods which are thought to draw good luck by eating during that period and they are packed in boxes called “Jubako”. 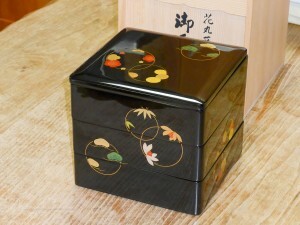 Jubako is used not only for New Year’s Osechi, but also for cherry blossom viewing and an athletic meet as a lunch box. When packed in Jubako, foods look beautiful and more gorgeous. Jubako usually consists of two to five piled boxes with a lid on the top and in which foods for Hare no hi (a special happy day) are packed. Jubako is used in the anniversary or for the event. Jubako is usually made of woods, resin, or sikki (japan) and some are made of paper or porcelain. There is also “Ageju” which can be attached to Jubako with carrying Agemono (deep-fried foods) in it. Jubako is thought to be invented long time ago as it appears in the documents of the Muromachi period, but it became popular among people in the Edo period. For Buke (the samurai class) and Daimyo (the feudal lord), gorgeous ones like urushi nuri (japanned) or makie (gold-lacquered) were made. When going to hunt, some version of Jubako which was easy to carry was used. Lunch boxes made in new materials like polypropylene are popular these days in Japan and Jubako seems to be used less than before. Anyway, why should foods be packed in Jubako? Actually there is a reason. It is from the wish for “piling the happiness”. As another reason, even though we have to prepare a lot of dishes for Osechi, Jubako does not need large space as it can be piled. 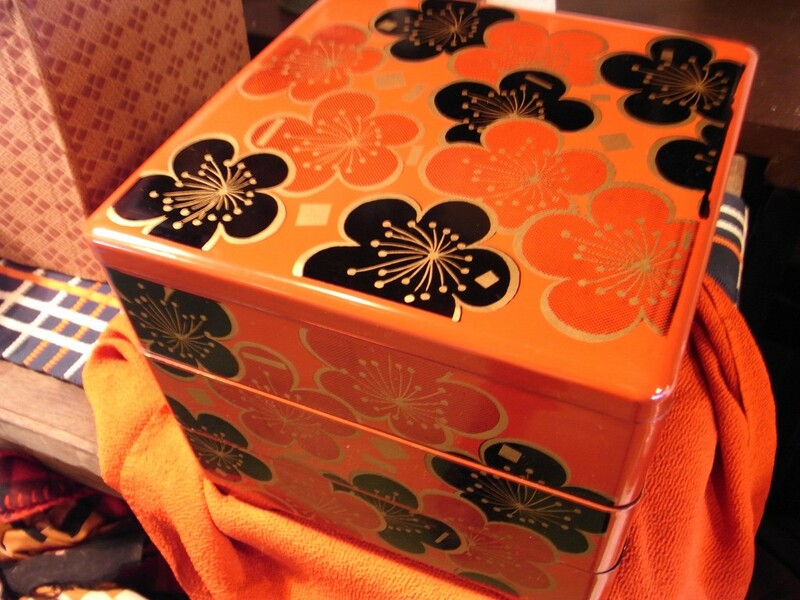 We eat Osechi foods during a few days, so the lid is needed to prevent dust or vermin from coming in the foods. Thus Jubako is suitable for keeping Osechi foods. As there was not something like plastic wrap in the old days, Jubako which can be piled with a lid was very useful. The store dealing in Jubako or general goods. ※The pottery class is also available there and you can try one day course. Loose Socks | Baggy socks are fashionable in Japan!